Robert Rutman (Berlin, 1931) went to the USA to study art in 1955. 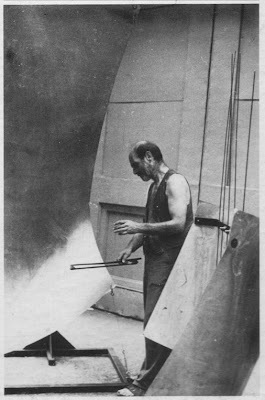 In 1975, he started building steel-metal sculptures to be played with a bow, like a violin, and founded the U.S. Steel Cello Ensemble. 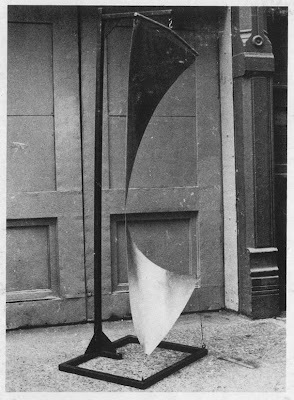 1939 (Pogus, 1990) documents some of these resonating sculptures and their ghostly drones: Tabla and buzz chime, Steel cello and bow chime, Chant bow chime and horn, Three bow chimes, Song of the steel cello. After a long hiatus, new compositions began to appear on Music To Sleep By (Tresor, 1998), Song Of The Steel Cello (Pogus, 1999), that contains the title-track, Zuuhh Muttie Mum (1999). 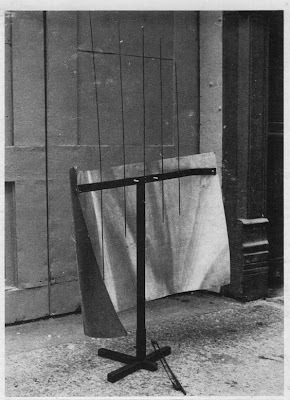 This is a recording of a concert by Robert Rutman and his steel cello's recorded sometime in the late 70's at a New York Art Gallery. 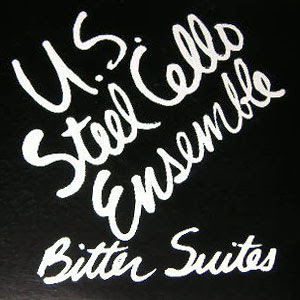 If you are unfamiliar with the Steel Cello Ensemble, it's basically a few people playing large sheets of metal which produce totaly amazing, spooky, droning outer-space sounds. Very much in the same league as Bertoia's sound sculptures. glad your spreading this one. I ripped this a few years back from vinyl and scanned the images... A old friends dad gave me that Lp... Its pretty beautiful sounding! What an absolute blessing to hear this, two months ago i was finally able to hear Panhuysen's "Long String Installations" & now THIS!!! i feel spoiled, yet so complete—just got through two straight sittings of this magnificent work. It's still resonating in my brain, in fact my brain feels cleaner? (or) split in two. i Love You Mutant Sounds, you shall be rewarded tenfold in the afterlife. Really wonderful searing ambient drone, reminding me of with Ellen Fullman whose gallery-long string 'instrument' performance I caught in Memphis in the late 80's. First of all, thanks again for all the intersting music I downloaded thanks to you. Maybe you know a track by a German band that was played by John Peel in 1983 or 1984... An electronic new-wave track called Ventilator. I had it on a cassette and lost it. If someone reading this knows anything, please drop me a note at cccc.ffff@yahoo.com. I used to work at the Museum of Fine Arts in Boston and in 2006 they started getting rid of their vinyl collection, this LP was one I found in a box in the break room marked "FREE". Wild stuff!